Visual Studio 2010 - Curly Braces auto-align has changed, how do I fix this? Update: Since I see this is one of my most looked at questions, now a few years later I should point out what I found to be the most common cause of this problem: bad syntax elsewhere in your code. 100% of the time I've had this happen, it was because I'd forgotten a curly brace for another block of code, or I had a dangling if, or an earlier line of code I didn't finish. Check for IDE errors first for something like ") or } expected"
I feel like this is an all time dumb question to ask, but I have no idea how to fix this and google is turning up nothing. But now it's just leaving it at the first one. I assume I accidentally hit a hotkey or something. Help me fix this please? If you have Power Commands installed you can then go to the Tools->Options->Power Commands and make sure "Format Document on Save" is selected. Whenever you save the edited file the Curly Braces will be auto aligned. 9 times out of 10 this problem is caused by bad code elsewhere on my document. Either I'm missing a ; on a line, or perhaps a closing }. Visual Studio is unable to figure out what I'm trying to write in code and thus it's unable to format. Check for compiler errors, fix them, and then press Ctrl+K then Ctrl + D to make Visual Studio reformat the current document (your hotkeys may vary, depending on the version of Visual Studio and your settings). Not the answer you're looking for? 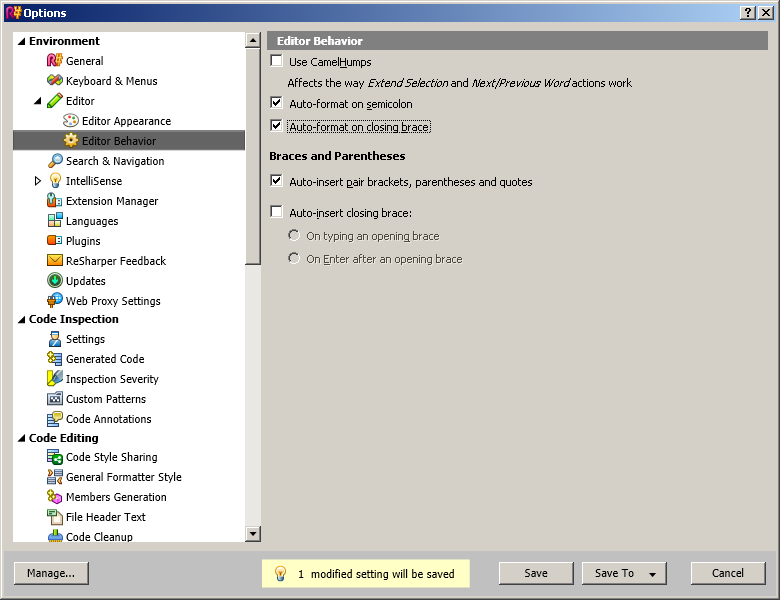 Browse other questions tagged visual-studio-2010 curly-braces or ask your own question.